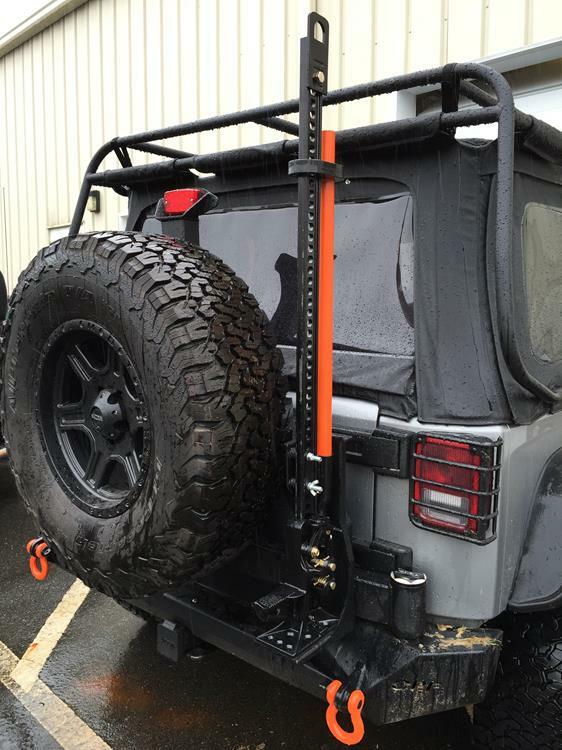 If you thought that Hurricane Joaquin would stop the Rightline Gear Jeep Build, you were wrong. We have a busy weekend planned as SEMA draws ever closer. A little rain (or in this case a ton of rain) and a flash flood watch or two is not going to stop us. Our Jeep Build would not be complete without a Hi-Lift Jack from The Bloomfield Manufacturing Company. The current jacks’ trace their lineage all the way back to 1905. It is amazing that a single product has remained relevant for such a long time period. We can only hope to develop a product with that long of a product life at Rightline Gear. 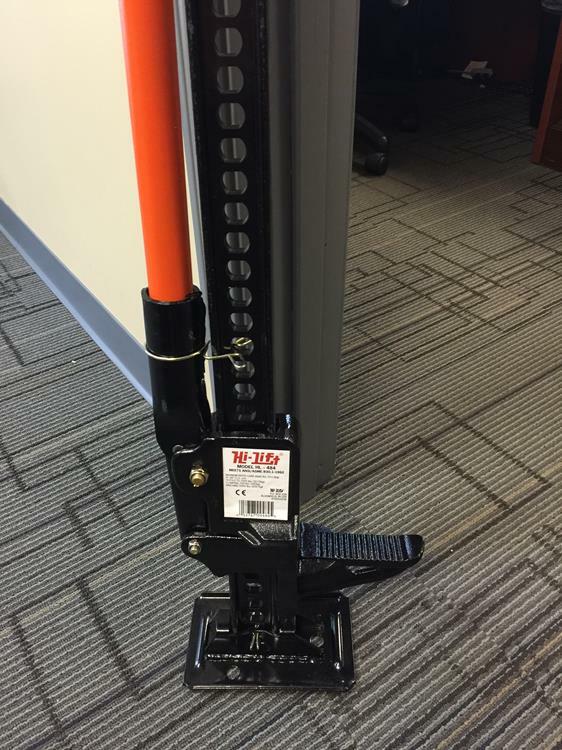 I opted for the Cast and Steel Hi-Lift Jack, 48″H, model HL-484. Because some of the Jack’s parts are stamped steel instead of castings, this jack is offered at a lower price than the All-Cast Jack. The Cast and Steel Jack maintains the same 7000 lb lifting capacity as the All-Cast Jack, however. 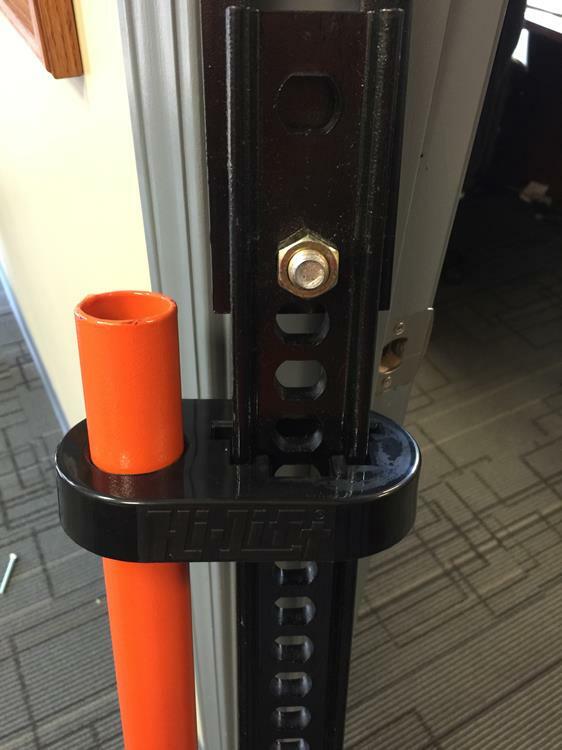 I painted the handle of the Jack our Rightline Gear orange color in Custom Painting Part 1. The handle attaches to the handle socket with a cotter pin. Hi-Lift provided the Handle Keeper accessory, HK-B, to hold the handle in place without rattling. My plan was to attach the jack to the Jeep using the OR-FAB Hi-Lift Jack Mount. The only problem was that the jack’s foot was wider than the base of the mount allowed. A quick call to Bloomfield confirmed that their Cast & Steel Jack’s feet are larger than their All-Cast Jack’s feet. 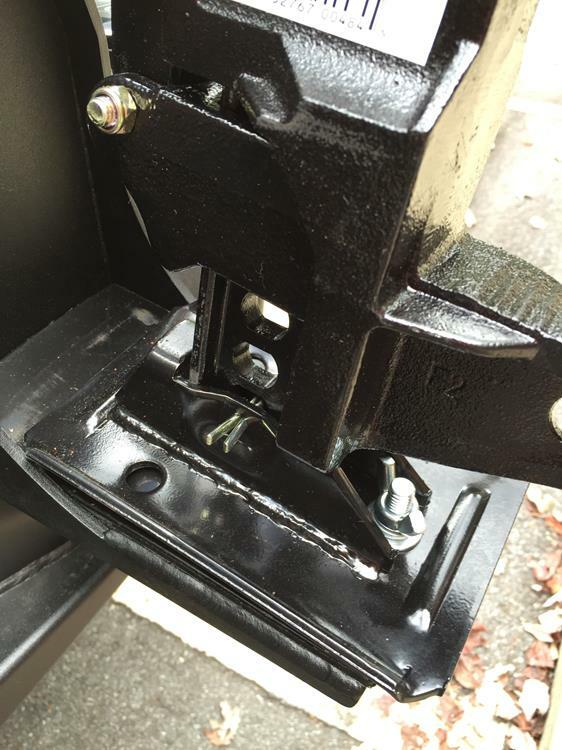 Going back to the drawing board led me to Art at T&A Offroad who planned to attach his Hi-Lift Jack on his Jeep in a way where foot size was unimportant. I ended up trading him my steel foot for his cast foot. 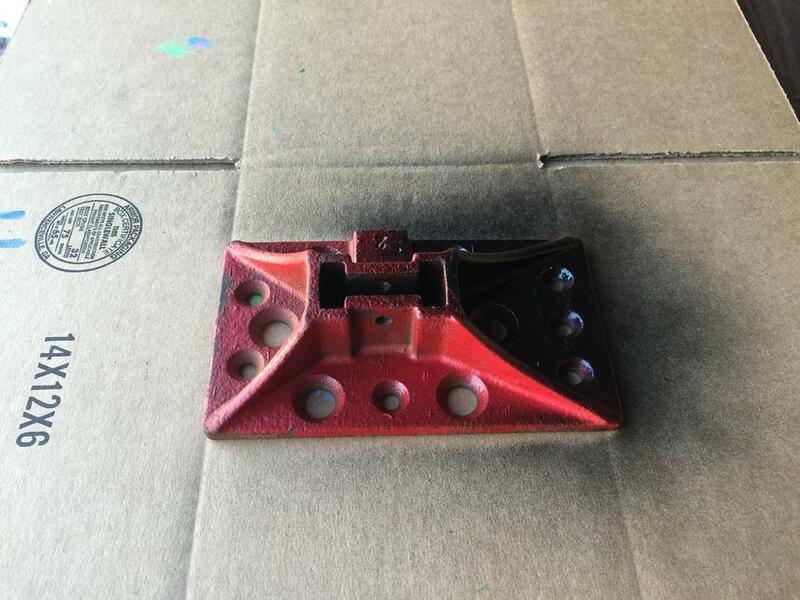 A couple quick coats of VHT Epoxy Paint and I was back in business. The foot attaches and un-attaches from the jack by the use of a cotter pin. Now that the Hi-Lift Jack foot would fit into the OR-FAB Jack Mount, I just needed to brave Hurricane Joaquin’s effects in the mountains of Western North Carolina to make it happen. The jack is held in place by a small bracket, (2) carriage bolts, and (2) wing nuts that run through the jack’s shaft. There is also a hole for another carriage bolt/wing nut combination through the foot of the jack. 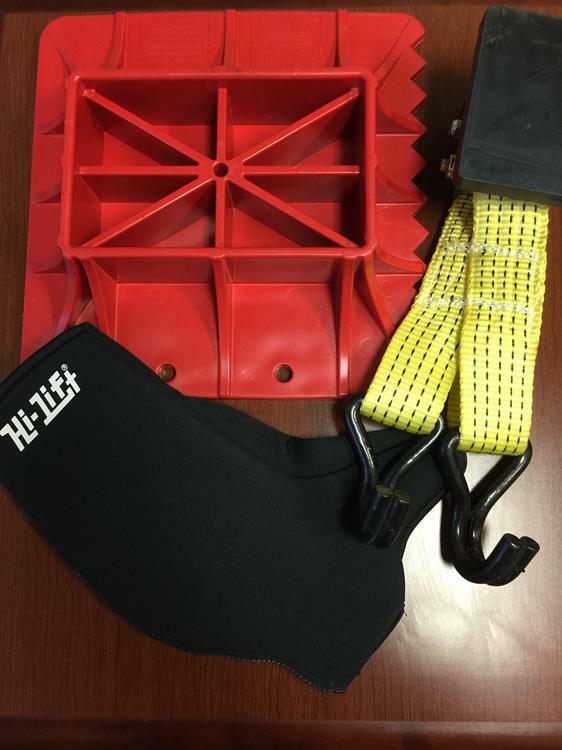 I was fortunate to receive a few additional accessories from Hi-Lift…. a Neoprene Jack Cover, a Lift Mate (which provides a lift point for any wheel on the vehicle), and an Off-Road Base (which prevents the jack from sinking into softer surfaces). We are set for the long road trip to Vegas and the day of desert off-roading we have planned for after the SEMA Show. Thank You Hi-Lift Jack!